“If an electron falls through a potential difference of 10,000 volts, the wavelength of its wave function is about 10-11 meter, less than 10-4 of the wavelength of visible light and less than the size of an atom. Electron beams can be guided and “focused” by magnetic fields and thus produce an electron microscope (invented in 1932 by Ernst Rust of Berlin) Electron microscopes can produce detailed pictures of , for example, viruses.” Taken from the book, Hidden Unity in Natures Laws. An electron gun generates an electron beam through the process of thermionic emission, before accelerating it through a potential difference. The electron beam behaves in some ways like a wave front in that it can undergo reflection, refraction and diffraction effects. Focused tightly onto a spot of around 5 nm in diameter and ranging in energy from several hundred eV to over 30 keV, the beam is rastered across the x-y plane by means of electromagnetic deflection coils. As the electron beam impinges on the sample surface a number of electromagnetic interactions occur which ultimately results in the emission of secondary electrons and electromagnetic radiation (photons) from the sample. When a high energy primary electron interacts with an atom it undergoes either inelastic scattering with atomic electrons or elastic scattering with the atomic nucleus. In an inelastic collision with an electron, the primary electron transfers a portion of its energy to the other electron. When this energy is large enough the other electron will disengage from the sample. If the electron emission has acquires energy less than 50 eV, then they are referred to as secondary electrons and it is these electrons which generate the topographical image. Back scattered electrons are the high energy electrons produced in elastic scattering and posses the same energy as the incident primary electrons. The probability of back scattering increases with the atomic number of the sample material and it is for this reason why gold (Au) is used for coating samples in SEM. In the experiment, an accelerating voltage of 110 kV was employed. Substituting this into the above equation yields a wavelength of 3.70×10-12 m or 3.7×10-3 nm. (n sin a) is often expressed as NA = Numerical aperture, which is engraved on each objective and condenser lens system. It is a measure of the electron gathering ability of the objective. Practically, the resolution will also depend on how thin the sample is. The thinner the sample (down to a certain limit), the greater the contrast and the finer the resolution will be. Letting Voltage = 5 kV and a = 1 yields a resolution of 0.1 nm or 1 A. However, because of each lens and aperture introduces their own set of aberrations and distortions they set a limit on the achievable resolution. In the case of this experiment, the practical achievable resolution, as analysed from the images obtained, was about 5-10 nm. The resolution of the SEM approaches a few nanometers with operation magnifications which range from around 10 to over 300,000. 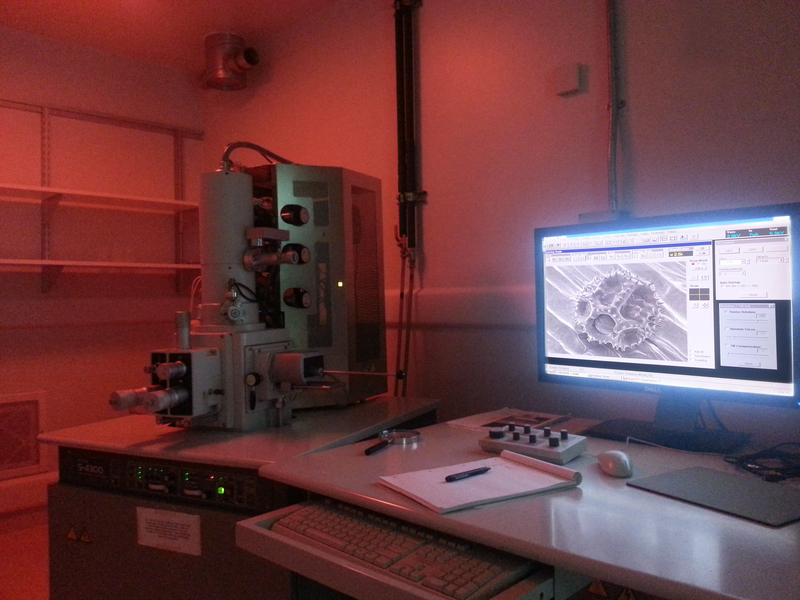 In addition to topographical information, the SEM can provide topographical chemical composition by Energy Dispersive X-ray Spectroscopy (EDS) and provides the ability to mill and etch away layers using Focused Ion Beams (FIB). Secondary electrons (SE) are low energy electrons emitted from the sample. The electrons can only escape from the sample surface because of their low kinetic energy.